2018 is a landmark anniversary year for many events, including the worst train accident in U.S. history that occurred at Dutchman's Curve in West Nashville, on Tuesday, July 9th, 1918. It's hard to believe that it's been 100 years and the Dutchman's Curve accident is STILL the worst train accident in U.S. history. I suppose it's also a good thing, knowing that no subsequent accident since has lost more than 101 lives like this one did, which included civilians, soldiers, and workers traveling to the new Du Pont Munitions Plant in Old Hickory. While most of the facts of the accident are already well-known among many, including Nashville citizens, I'm pulling most of my information from the book released in 2014 by Betsy Thorpe - "The Day the Whistles Cried: The Great Cornfield meet at Dutchman's Curve." Sidenote: The intro of her book states that the information that follows is a combination of both factual and imaginative details. So, as I pulled most of my information from Thorpe's book, some of the quotes and feelings listed below may be exaggerated. Just like most other mornings in the summer of Tennessee, the weather report states that it was a clear, cool day. Not as hot as it has been recently - the temperature stayed steady around the low 70's in the morning time, with a "100% of possible sunshine." Nothing out of the ordinary other than the relative humidity around 77. It had the makings of a beautiful day in Nashville and surrounding areas. The railroad engineer for the Number 4 train due to head west to Memphis that morning was David Campbell Kennedy. Like every other morning's stroll to work, Kennedy walked from his home to Union Station that morning instead of taking the street car; he preferred the daily stroll. What he carried with him for work was his railroader's box, which included a change of clean clothes, work gloves, a Mason jar filled with brewed coffee, and a brass clock. Also like every other morning, Kennedy met Conductor James Preston "Shorty" Eubank outside the telegraph office, waiting for their orders. This particular morning, Kennedy saw a group of passengers waiting nearby the office for his train, some of them included young military recruits. A group of about 30 recruits waiting actually, all wanting to board the Number 4, but it had already been overbooked. Only 5 of the recruits were able to get tickets. After they received their orders and headed out for duty, Preston told Kennedy (after checking his railroad watch), "Looks like we might be late meeting Number 7 at Harding." This definitely comes into play later on. Major George Hall (the Railroad Porter) - Major Hall was well-known in Nashville, most specifically as one of the most popular men of the fraternal circles (Knights of Pythias). Luther Meadows (the Fireman, a.k.a. the man responsible for steaming up the engine). The Postal Clerks - those responsible for sorting through the mail in the mail and baggage car. Each of the workers could sort 600 pieces of mail in an hour. The Baggage Master and Baggage Men (pretty self-explanatory, but they loaded the baggage onto the baggage car) - they also loaded a shrouded casket onto the baggage car. A strange fact I learned from Thorpe's book regarding the name "George" and the role of porters - evidently, the name George was given to all railroad porters. Under unfortunate circumstances how this came to be, but it's because of a man named George Pullman, who was a railroad car manufacturer. This custom started in 1867, when Pullman started hiring former house slaves to work as porters on his sleeper cars. It was based on the old tradition of naming slaves after their owners. This tradition carried on throughout other railway companies as well. But also an unknown fact, this tradition was opposed by 1904 by a wealthy American named George Dulany, who wasn't pleased with being associated with railroad porters. He started a society known as "The Society for the Prevention of Calling Sleeping Car Porters 'George"; they really oughta shortened that. But this society included "any white man whose given name or surname was George." For all you baseball lovers out there, guess what? George Herman "Babe" Ruth was a member of this society, among several other well-known men, such as the King of England. Yeah, even that dude. By the time the train was ready to leave the station, they were only 5 minutes behind schedule. Kennedy powered up the engine and got the ball rolling, or the train in this case. This came after he had placed his railroad watch on the dash; at that time, Kennedy noted that it was almost 7 o'clock. Kennedy was in the driver's seat of engine #282, and according to Thorpe, it was a fine machine. It was built for the railway in 1906, and was a baldwin class 4-6-0 (I don't know what that means, but it sounds important). The train cars were all made of wood, a bit of a rarity at that time apparently, considering newer passenger trains included cars and coaches that were made of steel. To save money however, the railroad bosses and stockholders had decided against replacing the train for awhile. Could this have been a contributing factor to the high death toll? Possibly. Wait and see. "Meet Number Seven at Harding Station to pick up mail," Meadows read aloud. "Number One being hauled by Engine #281 - hold at double tracks until Number One passes." When the train was underway, both the porter and conductor (Hall and Eubank) were performing their duties (Eubank was moving as fast as he could after being reprimanded for not picking up the tickets of the passengers on time) and managed to meet at the entrance of one of the regular coach cars. Eubank told Hall: "I sure am busy, George. I should be watching for the Number One to go by, but I only picked up tickets in two coaches. This train is terrible full and I don't have much time to get through the rest of it." Hall understood the stress and told Eubank in return, "Don't you worry none about watching for Number One, boss. I'll keep my eyes peeled for her." This was also a task that some of the other crew were performing as well, including the train's fireman up in the locomotive cab. Imagine what might've happened if trains had some form of communication between each other at that time? While Kennedy was rolling through an area 2 miles southwest of Union Station known as "The Shops" - one of the largest and most important train yards in the South - the Number 1 overnight-express train was 10 miles down the road, heading his direction at full steam. The train from Memphis was being hauled by Locomotive #281 and driven by Engineman, Bill Lloyd. This locomotive also happened to be the "twin sister" of Kennedy's train, coming from Nashville. Fireman Thomas Kelley of the Memphis overnighter asked Lloyd if he was really retiring like he planned, and Lloyd responded with: "You have my solemn word, son. This really is my last run." Two Jim Crow cars were filled with more than 125 African American workers, traveling from various southern states. They'd just signed on with the U.S. Employment Service the previous morning. Most were traveling to help manufacture the munitions plant in Old Hickory. A couple of trunks belonging to a group of Dominican Sisters - thought to be traveling home to St. Cecelia Convent in Nashville. Turns out, it was only their luggage and not them. Monsignor Murphy, one the most respected Catholic clerics in the state of Tennessee. I'm unsure if the map above shows the area that was referred to as "The Shops" as Thorpe describes it, but this at least gives you an idea of what it might've looked like, if this isn't the area that the Number 4 train came through. Wherever "The Shops" area was, that was essentially the point of no return for Number 4, since the track became a single line after that point. The Number Four approached the semaphore tower (a wooden tower with 2 hinged arms, set to display signals, messages, and warnings to train engineers) at the end of the yards area, noticed that the arm was pointed up meaning to proceed, and continued on its course. Number 4's engineer, Kennedy, also commented "Did you see the train that just passed by? It must've been Number 1. Let's get going. Time to pick up the mail at Harding." Only it wasn't the Number 1 train, that had been running a little late that day as well. It had been a switch-engine pulling freight cars that the assumption is, this is the train Kennedy mistook for the Number 1. If only they'd been paying attention to the many people trying to stop them before they opened the engine up, because the tower operator, J.S. Johnson, took off after them (and blew the emergency whistle). Even a group of men standing near the tracks saw that the operator was yelling at the train to stop, and proceeded to join him by waving their hats in the air at the train, but to no avail. The porter, George Hall, did notice something that seemed off though- possibly the people outside - but also that the train had passed the spot where they were supposed to stop and wait for the Number 1 train (again, I'm curious where she got this info from). Kennedy pulled the whistle cord and opened the throttle wide. As Number 4's porter, Hall, was pushing his way through the train's Jim Crow coach, trying to reach Eubank with the urgent message of what they were barreling towards, Kennedy was working the train through the bends of Dutchman's Curve - unbeknownst that they were minutes from a devastating tragedy. Perhaps if Hall had made it to Eubank in time to pull the emergency break or if Eubank had been paying attention himself, they could've stopped the train in time, to then go warn the Number 1 train to also hault. But fate is a strong thing, sadly. It was too little too late when Kennedy came around the last hill, and saw smoke rising above the newly-built bridge (White Bridge); smoke that didn't belong to his locomotive. As smoke from both engines mingled in the air, Kennedy quickly left from his spot and pulled the emergency break, before saying a prayer. When both locomotives struck each other, it was 160 tons of iron slamming into each other at what can be imagined pretty swift speeds for trains at that time. Both of the locomotives were forced upward into the air, with burning coal flying throughout the cabs and steaming-hot water spilling down to the ground as the boilers were ripped off from the wheels below. And this is word-for-word from Thorpe's book - "the bubbling cauldron's fell into the cornfield in an explosion of steam and boiling spray." As for the rest of the cars, well, sadly it doesn't get any better. Some of the cars were "telescoped" into others, meaning the force pushed them through and into the other cars ahead; pretty much demolishing the cars themselves and anything in their paths. One of the coaches in particular that this happened to was the Jim Crow car of the Number 4 train; it went through the baggage car in front of it. This unfortunately pinned men and women inside, between the walls of the 2 cars. Other cars ended up piled high in the air. From the Number 1 train, the cars derailed into the surrounding cornfields, also smashing into the nearby telephone poles. I'll spare you the details of how Thorpe describes how this collision affected the passengers. The cars spared the worst damage were naturally, the ones in the back. The last 3 cars of the Number 4 train appear to be the only ones not derailed, but still suffered a little bit of damage. You can imagine the noise this made, especially for some of the closest witnesses - the sisters and children at St. Mary's Orphanage, the crew of the Number 7 train waiting nearby at Harding Station, local farmers in their fields, and even a few motorists driving over the bridge. All came running quickly, hoping to help in anyway they could and with any tool they had. With debris scattered all over the cornfields and fires breaking out in several locations throughout the wreckage, helping crews had quite a struggle on their hands when assisting the victims. The death and injured toll changed quite a bit throughout the day and coming weeks, starting at 121 fatalities reported by the Tennessean the next day. But the final number given by the Interstate Commerce Commission was 101 fatalities, and another 100+ injured. Most of the fatalities were the African American workers traveling to Old Hickory, and soldiers. To see the full list of victims, check out the slideshow below. It includes the list in the appendix of Thorpe's book, and from the Nashville Globe newspaper clipping from July 12th, 1918. Before the accident site had even been cleared, almost everyone in the city pegged Kennedy as the main person to blame for the tragedy. It was obviously human error, but even some people that had supported and vouched for Kennedy's character and work ethic prior to the accident, were pointing their fingers solely at him. He was even dubbed "The Blunderer", even before his body had been removed from the wreckage. Personally, I understand their vicious need to point a finger. Afterall, clearly this was the worst tragedy on the railways that the city had ever seen just by surveying the wreckage, so people want to know why. But reading about the various steps that led up to them rolling through the Shops area without stopping to wait for the Number 1 train can't solely be one person's doing. Afterall, he saw the arm on the semaphore tower in the upright position, meaning "proceed" - whose fault was that? And why wasn't there a railway employee on the back of the train like usual, who would've seen the men in the Shops yelling at them? So no, I don't think that it was Kennedy's fault solely, though some of the blame can definitely be pointed his direction. But naturally, an investigation was announced just 2 days after the accident, by the Interstate Commerce Commission, the U.S. Federal Railroad Administration, and the Nashville Terminals of the NC&St.L Railway, to determine the blame. Several safety concerns were discovered, such as: the lack of a modern signal system, a properly operated manual block system on the single-track line north of "The Shops", and if the passenger cars would not have been made of wood but steel instead, it is estimated that the number of lives taken wouldn't have been nearly as high. 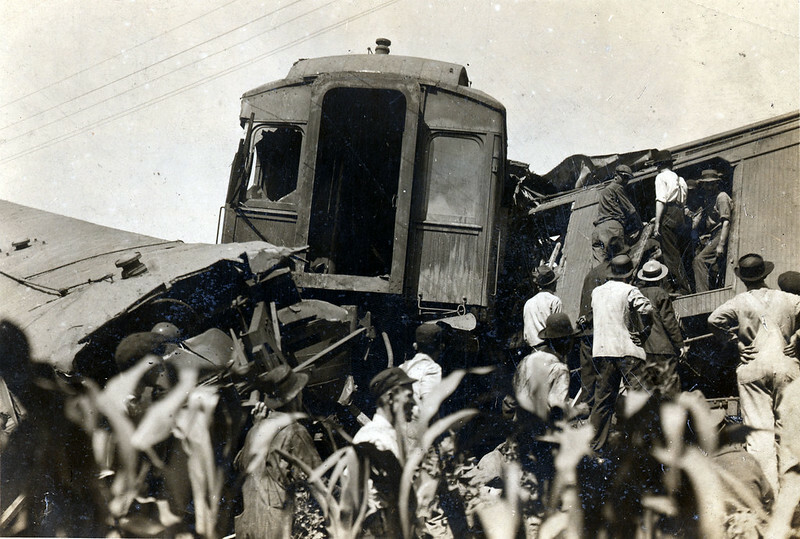 The accident also devastated and outraged the African American community and any opponents to segregation, because of the dangerous location of the Jim Crow cars; they were right behind the locomotive and therefore faced the highest number of casualities. Most of the victims that deceased from the accident were African American, many of which were the workers traveling to the Old Hickory munitions plant. The porter that I mentioned earlier - George Hall - the man trying to reach the conductor in time to stop the train, was also sadly a casualty of the accident. "...Must we always be penned up in the most dangerous place on the train, where it is impossible to save ourselves in such cases as this?...Take heed! Segregation must end! It must end here. It must end now!" This issue brought up the controversial Plessy v. Ferguson decision from 1896, that legalized segregation in public facilities, as long as the facilities were equal in quality. This is where the "separate but equal" doctrine came from. Sadly, the Plessy v. Ferguson decision wouldn't be overruled until the landmark 1954 Brown v. Board of Education case. "It seems to us a perversion of the statute to allow his representative [Kennedy] to recover for an injury directly due to his failure to act as required." Farmers nearby the wreckage site allegedly became shell-shocked by the sound of a train's whistle, half expecting to hear two at the same time again. After the investigation, safety concerns most definitely became a priority. Officials of the railway company worked to improve employee and passenger safety on their line, and this included in 1924, when 6,000 safety operations suggestions were submitted and responded to by the company. The "New Bridge" a.k.a. "White Bridge" became known by locals as the "Wreck Bridge". Many locals would often visit the bridge, remembering the horrific scene that occurred there in July, 1918. There are a few holds on it, but go ahead and add yourself to the list to read Thorpe's book. I skimmed as best as I could to make this a shorter blog post, but there's plenty more interesting details about the day's events that I left out. There's also a historical marker, located near the intersection of White Bridge Road and Harding, if you ever want to see the area yourself. The exact location of the wreck is said to be somewhere behind the Publix grocery store.